Over the last few weeks, and working with my colleagues Councillors Steve Williams and Bruce Berry, I have been calling on homes in this area to meet residents and discuss local issues. Thank you to everyone who answered their door and gave us their time. This post is a report back on the action we have taken on some of the issues that were raised most often by residents. If you were out when we called, or if you have thought of an issue since then, please let me know using the contact details on this letter. We can’t promise to solve every problem, but we will try our best! Meadowbrook Road: the issue raised by many residents was the ongoing problem of speeding traffic. The Town Hall has advised me that they prioritise the road safety budget on the roads with the highest recorded number of crashes and collisions. I have asked, again, for a new review of the traffic in this area and for possible solutions. Dog fouling: sadly, a small number of owners are still not picking up after their pets. Some additional signage (for the owners, not the dogs!) would help, as would extra publicity for those people who are being fined for not picking up after their pets. Harlian Avenue Pot Holes and flooding: people mentioned the condition of the carriageway and the ongoing flooding problem when it rains. We have asked the Council to look into the issues raised and come up with a solution. Childwall Close and Oak Close parking: several residents asked about parking issues in this area and asked if improved lineage including yellow lines would bring about an improvement. Childwall Avenue: residents raised concerns that Childwall Avenue was being used as a ‘rat run’ by vehicles to avoid Moreton Cross and have asked if any traffic calming measures could be introduced. We have asked the Council to look into this request. Faulty street lights: we have reported those street lights that were ‘on’ during daylight hours. I am now reporting back on the action we have taken on some of the issues that were raised most often by residents. If you were out when we called, or if you have thought of an issue since then, please let me know. We can’t promise to solve every problem, but we will try our best. Cobham Road: the issue raised by many residents was the ongoing problem of speeding traffic. While the Town Hall installed the ’20 Zone ‘ signs some time ago, there are still some drivers, using this road as a short cut, who are causing a problem for people who live here. The Town Hall has advised me that they prioritise the road safety budget on the roads with the highest recorded number of crashes and collisions. I have asked, again, for a new review of the traffic in this area and for possible solutions. Pot Holes: people also mentioned the unfilled potholes, many of them marked to be filled. We have asked the Council to fill these as soon as possible. Overgrown tree: we have asked for the tree near the junction with the Oak Close footpath to be trimmed at the based, to enable pedestrians to pass more easily. Faulty street lights: we have reported those street lights that were ‘on ‘ during daylight, including one in Seawood Grove. Willow Grove: we have reported the poor condition in some places of the pavement and have also asked for action on the overgrown weeds. Altcar Drive: residents enquired about the overgrown piece of land at the entrance to the Drive from Cobham Road. Planning permission was granted in April 2014 for a one and a half storey dwelling and a single garage on this plot. (Planning Application – APP/14/00106) The landowner has three years to start the build. In the meantime we have requested that the landowner maintains the land and the fencing so that it is not an eyesore. several residents commented on our recently re-launched email news bulletin. If you would like to sign up to receive these monthly bulletins on local issues, please let me know. Vehicle crime: in May, there was a reported theft from a vehicle in Childwall Avenue. Police are asking residents in the area to ensure that vehicles are kept locked, with no valuables left on display. Equally, that sheds and side gates are kept locked. Finally, if you have any comments or questions on a ny issue in this letter, or anything else you would like to raise, please let me know. Your three councillors work for all residents, regardless of how you may have voted in the recent election. Now I fully support and respect the Mayoral position in Wirral, however I am concerned at the cost of the Mayor Making event, particularly when so many Council staff have lost their jobs and others have had to take pay cuts, so I submitted a Freedom of Information request to determine the cost of the Event held in May of this year. The Councils FOI Officer has responded with the information below. The cost declared up to now is £3,720.40. Do you think this money could be better utilised? *Regarding the cost of Members’ Travelling Expenses, this figure will not be known until all claims have been submitted. In accordance with Section 16 of the Freedom of Information Act 2000, we would advise resubmitting your request for this information at a later date by which time the Council may hold some recorded information. The directly attributable costs for the Mayor Making 2015, as shown in the table above have been assigned to Civic Services. Over the last few weeks, and working with my colleagues Councillors Steve Williams and Bruce Berry, I have been calling on homes to meet residents and discuss local issues. Thank you to everyone who answered their door and gave us their time. Below is a brief summary of the issues and the action taken. Maryland Lane pavements: the recently laid surface, near the bungalows is already lifting. Clearly not a job that was built to last. I have asked for the area to be reinspected and the lumps and bumps to be removed, before anyone else trips. Lingham Lane Postbox: we have contacted Royal Mail and asked for the Postbox to be repaired or replaced as quickly as possible. 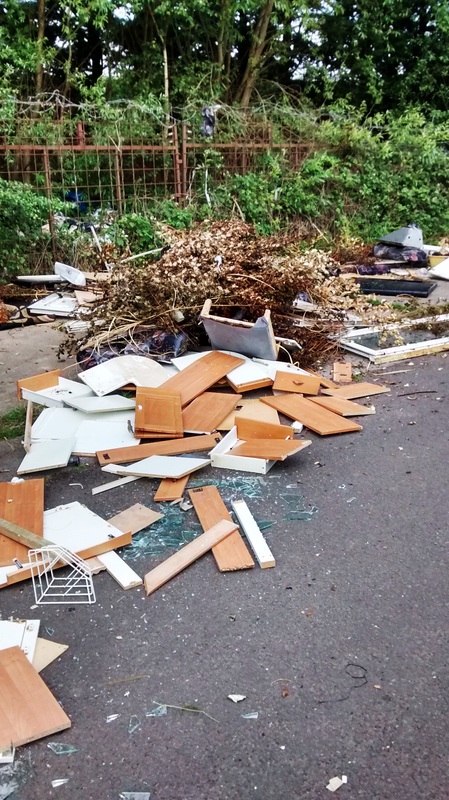 Rubbish hotspot – Old Maryland Lane: the litter at the rear of the homes on Barnston Lane has now been removed, following our requests to the Council. Grass cutting: we noticed that several of the grass verges had not been cut and so asked for action by the Council’s contractor. I am pleased to report that many of the verges were tackled within two days of our request. Bramble Way footpath and steps: this footpath to Pasture Road is, once again, being used for anti social behaviour. I have again met with council officers on site and have asked for action to tackle this. Berrylands Road steps: access for some residents with prams or mobility scooters is difficult due to the steps leading to the footpath (behind Harvest Court). I have now met with Council officers to see if the steps can be turned into a ramp and hope to report back soon on this. Overgreen Grove:the dropped crossing at the junction with Digg Lane is damaged. I have asked for action and the Council has agreed to repair it. Parking Issues: residents in Digg Lane, Overgreen Grove, Netherton Road, Fairfield Crescent and parts of Berrylands Road are all reporting difficulties in parking – mainly due to the increase in car ownership and lack of off street parking. There is not a great deal that can be done although we have asked the Council to look at some extra parking where possible in some locations. Netherton Road: I have also asked for ‘dropped crossing’ at the junction of Netherton Road with Digg Lane to assist people with mobility issues. Pasture Road: tree roots are damaging sewers while overhanging trees (on the footway at the bridge) are also a problem. We have asked for action by the Council and Magenta Homes (who own the land where some of the trees are located). Sunnyside: issues were raised by residents regarding the footway, grassed/weeded area and fly tipping. Unfortunately the Council tell us that Sunnyside is unadopted (ie not owned by the Council) and, as such, they will not take any action on these issues. Meadfoot Road burglary: the latest report on the website http://www.police.uk includes a burglary in Meadfoot Road in April. Residents are asked to ensure they keep doors and windows locked, particularly ground floor at night or if they go out and the same for garages and sheds. If you would like help to set up a ‘HomeWatch’ scheme in your road, please let me know. Finally, if you have any comments or questions on any issue in this letter, or anything else you would like to raise, please let me know. Your three councillors work for all residents, regardless of how you may have voted in the recent election. Earlier today I received a report of Fly Tipping in Carr Lane, Moreton. Two lots of household waste dumped one in the road and the other in a cutting to the side of the road. I had only just reported this when another email came in reporting what appeared to waste from a cannabis farm, old plants, plant pots etc again in Carr Lane. I requested an urgent response before any interest was shown, particularly by children and the Council responded immediately clearing both the Cannabis waste and the household waste in the road. The other pile of fly tipped household waste will be removed tomorrow. The household waste has lots of evidence of where it has come from, name and address and hopefully from that evidence the Council will discover who this (these) moron(s) who pollute our area are and prosecute them using the full weight of the law to send a strong message. Thanks to the residents who reported these instances and thanks also to the Council for their rapid response.